January 19, 2018 – Like many Sacramento Valley rivers, the Yuba was once amazingly productive. Hundreds of thousands of salmon and steelhead would trek up the river each year to spawn, and benefit from the vast riparian vegetation and marshlands that also served migratory birds and wildlife. 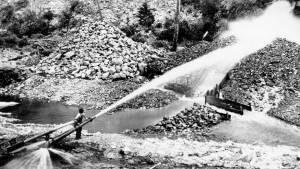 But with the Gold Rush, came hydraulic mining, blasting away mountainsides with high-pressure water so the miners could sift through the sediment for gold. Incredible amounts of sediment and debris washed downstream, impacting navigation (riverboats were a primary transportation mode back then) and causing massive environmental damage, devastating the fish population. The fix was the government’s construction of Daguerre and Englebright Dams – debris dams, to prevent the remaining sediment from flowing downstream. This impacted the fish even more, because Englebright Dam blocked all upstream passage to historic habitat, while Daguerre impairs fish passage. Fast forward to the 21st Century. The Yuba County Water Agency and the US Army Corps of Engineers are working together on a plan to improve habitat conditions of the Yuba River. The draft plan recommends the restoration of approximately 178 acres of aquatic and riparian habitat along the lower Yuba, between Englebright Dam and the confluence with the Feather River, downstream of Marysville. The plan is now available for public review. I encourage you to read it and submit your comments for the record. Let the Corps know if it meets our community’s needs. YCWA appreciates the restoration suggestions included in this draft report, but we continue to encourage the Corps to do even more, including reexamining fish passage improvements at Daguerre Point Dam, specifically, step pools. Construction of a series of ascending, curved steps on the downstream side of the dam, would improve the ability of salmon, steelhead and other fish to pass the dam in their journey to and from upstream habitat. A step pool would not only enhance the Corps’ proposal, but it would also have complementary public safety benefits. That possibility did not make it into the tentatively selected plan due to budget and schedule constraints, but we hope it will be part of the future. YCWA has spent a huge amount of time and effort to improve habitat in the lower Yuba River for salmon and steelhead. The most significant improvement in decades was implementing the Lower Yuba River Accord, with its higher instream flows during the summer and fall. While our actions and those of others show some good progress, more improvements are needed to address the loss of historical habitat. We will continue working with the Corps, other agencies and interested stakeholders in an effort to identify the best combination of restoration, recreation and public safety measures for the long-term sustainability of the Yuba River and this community. Curt Aikens is the General Manager of the Yuba County Water Agency (YCWA).